After Six-Day War, An American Became A West Bank Settler : Parallels The 1967 war changed lives forever. After Israel's victory, an American student saw a biblical promise fulfilled. He moved his family to the West Bank — but their pioneering life came at a price. 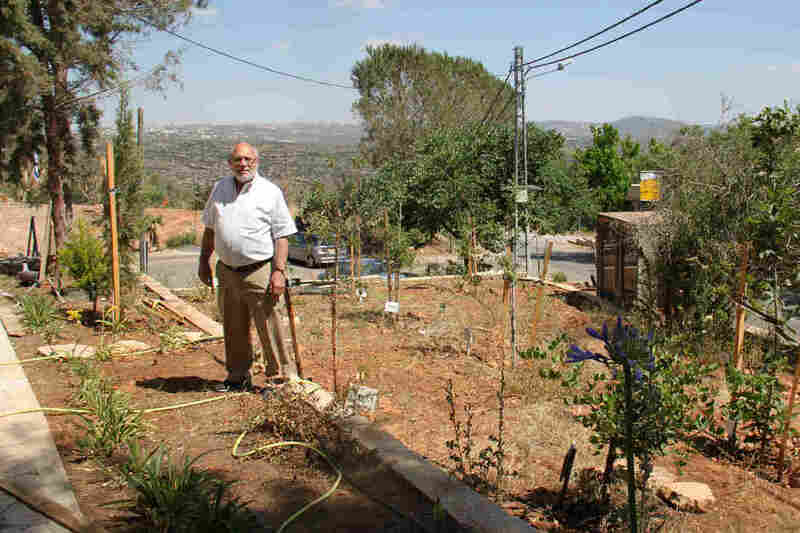 Ephraim Bluth, originally from New York, stands in the yard of his home in the West Bank settlement of Neve Tzuf, also known as Halamish. Fifty years ago, Ephraim Bluth was standing in front of the bathroom mirror, shaving. And listening to the news that Israel was at war. He was a 19-year-old college student at Brooklyn College, born and raised in Brooklyn, and a devout Jew. To him, it felt like Israel was the biblical David – up against many, many Goliaths. "The sense at that moment was that Israel was standing at the edge of a precipice. Israel was at risk," Bluth recalled, sitting in his son's Jerusalem apartment. "And then, thank the Lord, six days later, everything was different." Israel had won, tripling the amount of land under its control, including east Jerusalem and the West Bank of the River Jordan – land featured in the Bible. Bluth saw Israel's capture of the land as a biblical promise fulfilled. "Someone once said to me, 'You can transplant a tree anywhere, but it grows best in its natural environment,'" Bluth said. "For us, as Jews, Israel is the place we need to be. Israel is the place we want to be." Bluth and his wife Shoshana moved in 1971 to Jerusalem, became Israeli citizens and had eight children. He worked for the Jewish Agency, a semi-governmental organization that encourages other Jews around the world to move to Israel. Then, in 1988, his family made another move: to Neve Tzuf, also known as Halamish, a Jewish settlement in the West Bank established in 1977. The Bluths liked the rural lifestyle of the West Bank and wanted to help strengthen the Jewish presence in the captured territory. But Bluth doesn't like the word "settlement." "I prefer the word community to settlement," he says. "Unfortunately, the word settlement has been given a negative connotation." That's because, in the eyes of most countries, Israel's West Bank settlements are seen as a key obstacle to reaching Israeli-Palestinian peace. Since the 1967 war, about 600,000 Israelis have spread out in the West Bank and east Jerusalem. Palestinians want those areas for an independent country of their own, and it's a matter of near-unanimous international consensus that Israel's settlements are gobbling up the very land that is supposed to be negotiated in a peace deal between Israel and the Palestinians. Even Israelis are divided on the issue of settlements. But today, settlers are a part of the Israeli elite, holding top jobs in the government and the military. Bluth's daughter served in the army and his seven sons all served as combat soldiers, some in elite units. "They have shown an ability to lead with courage and distinction," he said. "I don't think it's an accident." He thinks a pioneering life as settlers gave his children their sense of patriotism. His son, Netanel, then 19 years old, was severely injured in 2002, when a Palestinian attacked a Jewish religious school he attended in a settlement in the Gaza Strip, which Israel captured in 1967. (Israel removed its settlements from Gaza in 2005). Ephraim Bluth has planted new saplings in his garden, each with a plaque bearing the name of one of his 28 grandchildren. Israeli authorities say Palestinian arsonists threw a firebomb in November 2016, causing a forest fire that consumed Bluth's yard and burned down neighboring homes in his West Bank settlement. Netanel eventually recovered from the attack. Despite his son's near-brush with death, Bluth does not regret moving his family into the heart of a conflict. "These are the risks we need to take if we want to establish our independence. You need to fight for your independence," he said. The way Bluth sees it, Israel is still fighting to keep the West Bank – and there will only be peace once his Palestinian neighbors accept that he and other Israelis are there to stay. Driving with Bluth from central Israel to the West Bank, which he calls by the biblical name Judea and Samaria, we pass an Israeli checkpoint. "You'll notice in many cases, the hilltops are barren," Bluth says. We pass a cluster of billboards advertising new homes. "There is a tremendous amount of building, a tremendous amount of construction," Bluth says. We drive past a Palestinian village and enter a hilly area carpeted in olive trees. We pass an Israeli army encampment. At a bus stop, we see a Palestinian minibus picking up two young Palestinian men. "The road is open to both Arab and Jew," Bluth says. "And this is normalcy." But for many, I point out, the pervasive presence of the military in the West Bank does not feel normal. "Israel is at war," he replies. "We need to maintain the ability to respond to military action taken against soldiers and against civilians. Unfortunately, that's Israel's normalcy." Palestinians see soldiers not as their protectors, but as their enemies who control their movement, arrest Palestinian suspects in the middle of the night and kill and wound them during clashes. They see Bluth's settlement as sitting on stolen land. When some settler youth fixed up a nearby spring, building low walls to collect the water into deep pools and bringing in picnic tables, it was seen as a takeover and led to Palestinian protests. Late last year, Israeli authorities say, some Palestinians threw a firebomb into a forest next to Bluth's settlement. It started a forest fire that damaged Bluth's home and destroyed his neighbors'. It also burned nearly all 28 trees Bluth and his late wife had planted for each of their 28 grandchildren. Now, the garden is filled with new Goldcrest cypress and pomegranate saplings, each one accompanied by a small plaque bearing the name of a grandchild. "Happily, they've all been replanted," Bluth said. And the families whose homes were burned down are about to begin rebuilding. "We are rebuilding not just homes. We're rebuilding futures," Bluth said. 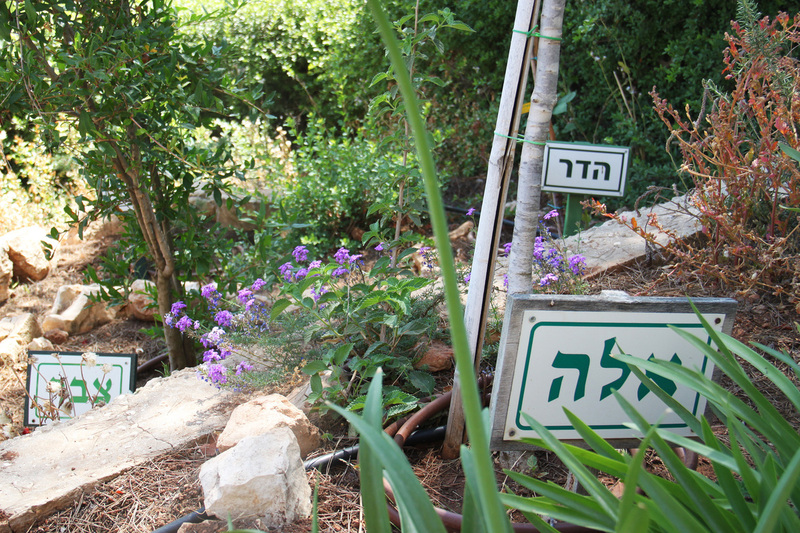 Fifty years after he was inspired to go to Israel, Bluth is firmly rooted in the West Bank. He's 69 years old now, with a trim white beard. He's just remarried. And he's renovating his home to make room for more grandchildren.